As a full moon shone over Glasgow, even the most casual observer would notice something was afoot in Bath Street as a sea of basque and suspender clad men, sparkling women and the odd bemused Rocky Horror virgin made their way to the King's Theatre. Somehow the shining torch of the full moon only added to the surreal gathering outside the theatre as if a passing cloud could magic it all away. This is the 40th anniversary "party production" tour and certainly the audience were more than willing to bring the party. As the narrator commented on the "eerily well-prepared" audience, Glasgow showed its true, shameless colours as volley after volley of heckles and innuendos rained on the stage. As the narrator, Philip Franks effortlessly batted back every heckle with witty retorts and asides that kept the audience roaring with laughter. His Shakespearean interpretation brings the perfect combination of gravitas and comic timing and the audience rightfully went wild in appreciation as he ripped off his trousers to reveal his suspenders in the finale. Frank n Furter is a role that carries big high heels to fill with a glittering list of well-loved stars who have put their stamp on the character over the years. Oliver Thornton's years as Felicia in Priscilla Queen of the Desert have certainly more than prepared him for the part and he puts his own stamp on Frank, not an easy task when the role is so known and beloved. The second Frank's cape parts revealing Thornton's muscular, basque clad body the entire audience could appreciate the slippery slope Brad and Janet found themselves on. Thornton struts across the stage as if he owns it, seductively teasing the audience and if more audience participation was needed there would be an extremely disorderly queue winding its way through the stalls to join him in that bed. Ben Forster, last seen in the Jesus Christ Superstar arena tour, and Roxanne Pallett geek it up as the not so innocent Brad and Janet bringing show stopping voices and superb chemistry. It takes a very secure man to run around the stage in Brad's unflattering underwear! There can be no criticism of Rhydian's dedication to the role of Rocky, his rippling muscles can only be the result of some serious time in the gym. Although his fake tan left much to be desired, less St Tropez more St Poundland, his energetic performance coupled with that incredible voice creates a different type of Rocky than I've seen before but as he's his Master's creation no two Rocky's will ever truly be alike. 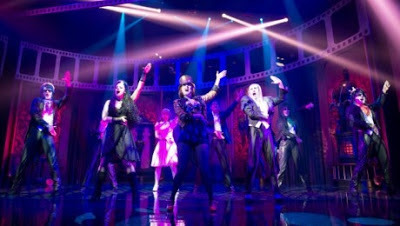 Featuring a giant strip of film spooling across the stage in homage to the B movies that in part inspired it, the new set itself is relatively sparse but then for most Rocky Horror is about the mayhem unfolding on stage as opposed to the surroundings. The only scene that felt a little flat due to the lack of staging was the finale when the castle departs and the floor show with little more than a strip foil curtain adding little glamour. LED strip lighting, while used reasonably effectively, didn't mark any real change to the setting but with the audience already antsy to Time Warp again, the party kept on rocking. The circle was bouncing as the whole theatre jumped to the left and stepped to the right and the pelvic thrusting shook the floor leaving the audience wanting more. The party production lives up to its name and Rocky Horror is looking better at 40 than some younger shows. 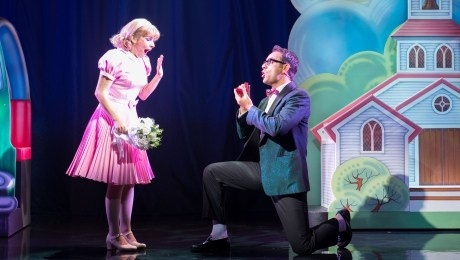 It might have been a freezing cold Monday night in February but it's always Saturday night in the theatre when Rocky Horror is in town - catch the party before it Time Warps away.